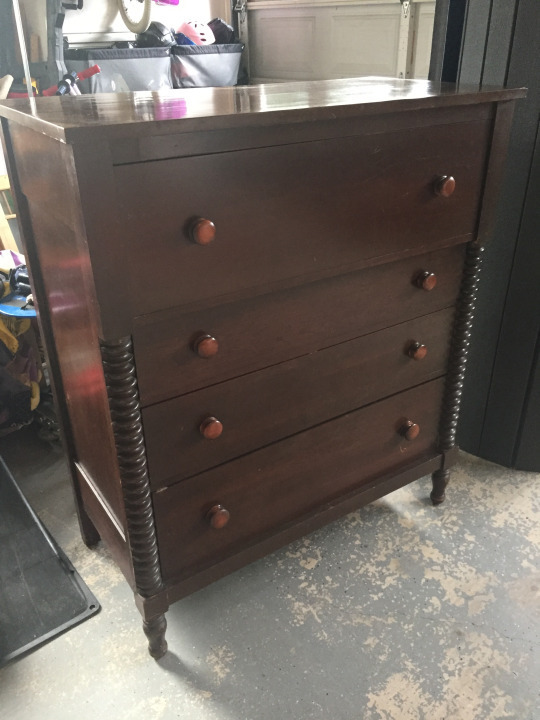 I have been looking for a flat-front dresser to paint for quite some time. When I ran into this one at a small consignment shop near by, I knew it would be perfect for my vision! I paid for it, knowing I would have to bring my husband, and the trailer, to pick it up the next day. 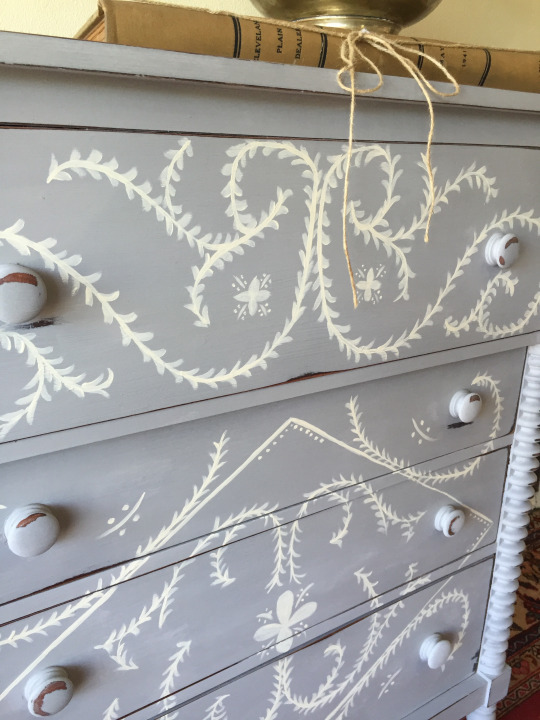 When I showed Chris the dresser I had purchased, his mouth dropped open! He said it was the ugliest dresser he had ever seen and couldn’t understand why I had bought it. I admit, you need a little vision to see it’s potential. However, the size of this dresser is substantial. It has wonderful deep drawers that slide open easily, and it doesn’t wobble! This means I can start doing the fun and creative stuff right away! 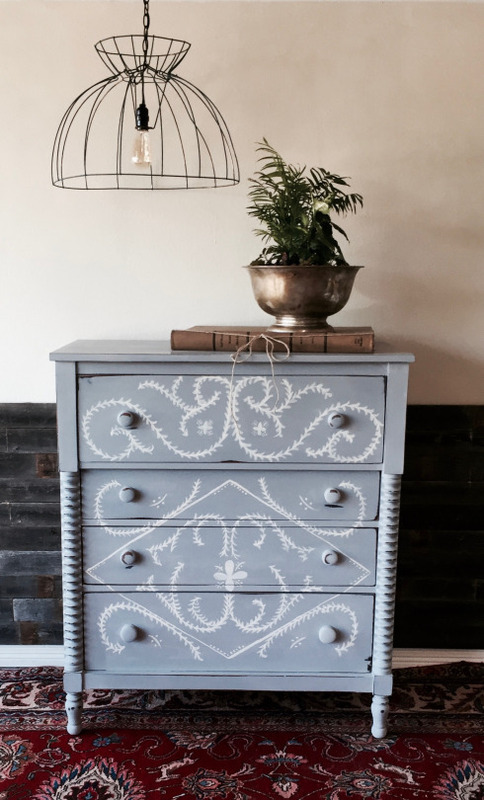 I started by giving it a light sanding, then painting it with a soft grey chalk paint. 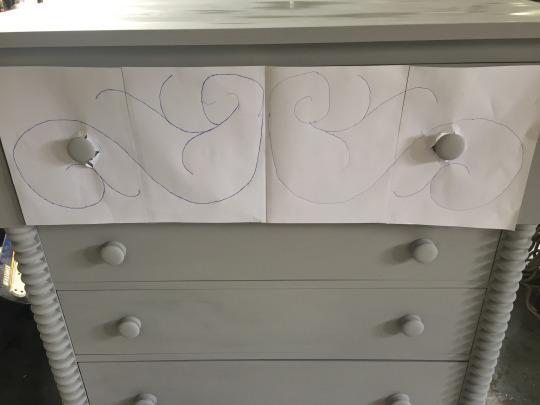 While the paint was drying, I made my stencil by taping four pieces of paper together and drawing out the basic design I wanted for the top drawer. 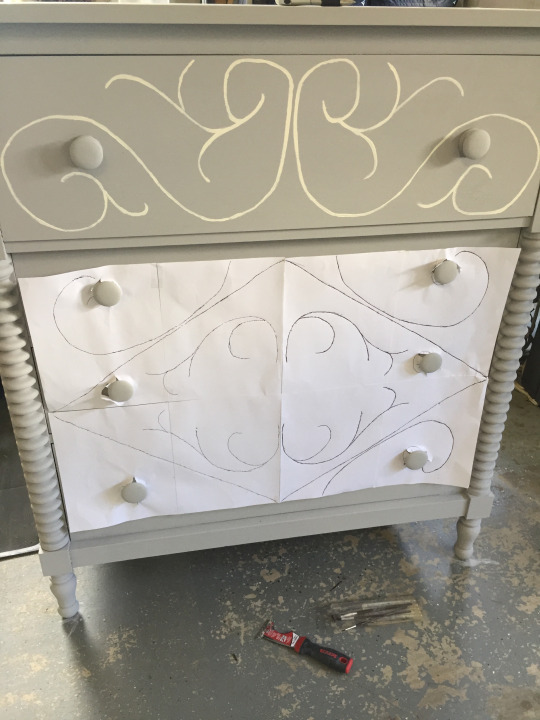 I stuck the paper on the drawer, then with a pen, traced my lines, leaving a very faint mark on the paint. 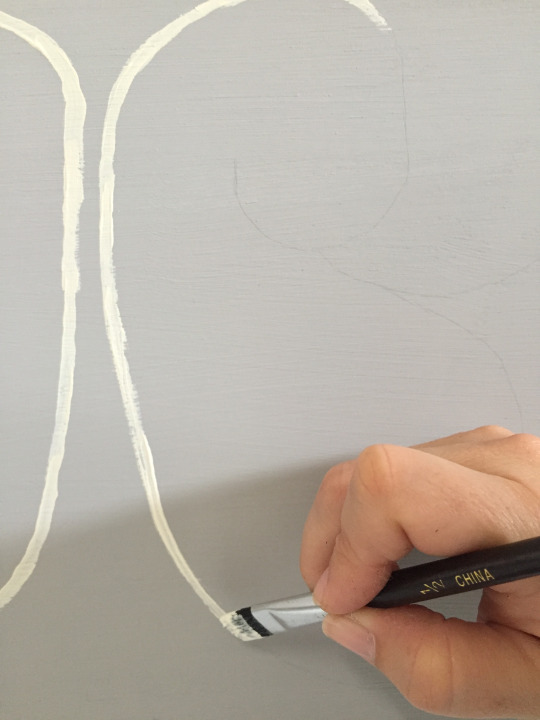 With a white chalk paint, I traced the lines I had made with the stencil. I went over the lines with my small paint brush a couple of times to even them out. After all, you want a hand-painted look, but not one that looks like a kindergartner did it. Sometimes, that’s a fine line. Once the top was done, it was time to do the bottom the same way. I purposefully left empty spaces in my stencil to be able to free hand the smaller details..
Once I got the basic lines on, I added all the detail. This was where the piece came alive! With every added leaf and dot, she was looking more like my vision. I distressed it a bit around each drawer and on the nobs, standing back and looking at it from a distance, then distressing it a little more until it was perfect. I finished her off with a clear coat of wax. My absolute favorite part of any project is taking the After pictures. It’s like dressing up a child for the prom. I just keep looking at her, smiling proudly, knowing soon she will be moving away. Then annoying the rest of the family by constantly showing them the pictures. Make sure to check out this beauty, and other pieces, for sale at the Grapevine Antique Mall! Timeless Interiors by Lancine L.L.C. Address: 2901 Creek View Dr.